Susan Svendsen has a special talent: she has a unique ability to make people confide in her and tell her their innermost secrets. She has exploited that talent, and now has a prison sentence hanging over her head for punching a Bollywood actor in an Indian casino. To make matters worse, her husband is on the run from the mafia, one of her children has been accused of antiquity smuggling and the other has run off with a monk. 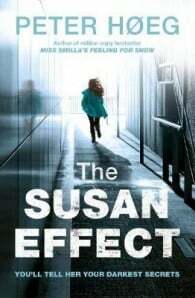 But Susan gets an offer from a former government official – an offer to use her power one more time and have all her charges dropped so she can return to Denmark. Together with her family, she must track down the last surviving members of a secret think tank of young talents founded in the 1970’s, the so-called Future Committee, and find out what was written in the committee’s final report. But the report is apparently covering up information of great value, and some powerful people are determined it is not revealed. Peter Høeg was born in 1957 and followed various callings - dancer, actor, fencer, sailor, mountaineer - before he turned seriously to writing. He published his first novel, The History Of Danish Dreams, in 1988, and was called 'the foremost writer of his generation' by Information magazine. His crime novel Miss Smilla's Feeling For Snow received international acclaim and was an international bestseller.